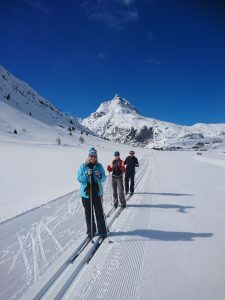 The good thing about cross-country skiing is that it’s an activity that almost anyone can try, and it’s just as fun for beginners as it is for seasoned pros, as our editor recently found out in the Austrian resort of Galtür and its tiny neighbouring hamlet, Wirl. Some resorts lend themselves to cross-country better than others and Gältur is one such resort. 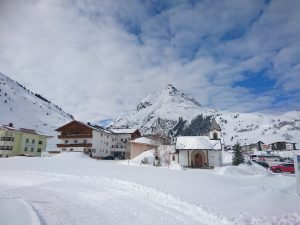 Situated in a wide valley and surrounded by chocolate-box scenery, it feels more like a working village than a ski resort, a close-knit community of just 850 inhabitants, and considerably more rural than its chic neighbour Ischgl, just a 20-minute free (with a valid ski pass) bus ride away. And so we piled off the bus on a daytrip from Ischgl, and straight into a tiny ski hire shop in the hamlet of Wirl (just beyond Gältur, up the valley) to be kitted out with some cross-country skiing equipment: long, skinny skis with pointy front tips to help us glide easily along the cross-country tracks; long, light ski poles; and ski boots – lovely lightweight, cross-country ski boots, which joyously resemble running shoes more than rigid, clunky alpine ski boots. I joined the beginner class. After all, I’d only briefly tried cross-country skiing twice before. The ski trail started outside the shop and before long we were practising the basic gliding technique on the flat – that distinctive diagonal stride where you slide one foot forwards and swing your opposite arm forward in a jaunty fashion to provide propulsion (not dissimilar to Spotty Dog’s walk for those old enough to remember The Woodentops on Watch with Mother). Within half-an-hour I was chuffed to be promoted to the intermediate group. My instructor, Katerina Kucerova, was obviously impressed with my spotty dog gait. And so I found myself doing some proper cross-country, from Wirl down the Paznaun valley to Galtür. At first it was tricky to stay in the groove, and to keep up with my two other classmates, but with encouragement from our patient instructor, Gregor Kathrein, I soon got into the groove – quite literally: you ski in deep grooves. In fact, once in the groove, for an anxious beginner it can be hard to get out of those grooves without a tumble, believe me! I had made another rooky error though. I’d dressed in my alpine ski gear and, as cross-country is by no means a gentle walk in the park, I was getting seriously overheated on the way back from Galtür to Wirl as the entire home run was very slightly uphill. We’d only done a fraction of the 40kms of cross-country trails here, but by the end of my half-day of beautiful cross-country skiing in the spring sunshine, I’d certainly deserved a good lunch. I was not to be disappointed. Just up the piste from the ski hire shop we tucked into a delicious lunch at the Hotel Almhof – chunky dishes of Käsespätzle (cheesy noodles), Rösti (potato cakes) and Gröstl (beef and potato hash topped with fried eggs) – washed down with local wine, and with a generous portion of Beerenschmarrn (thick pancakes smothered in wild berry sauce) to follow. I forewent the local tipple – a gentian Schnapps. After all, it was only lunchtime. 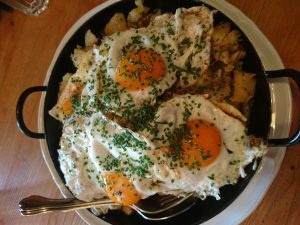 In fact, by the end of lunch, I wished I’d brought my swimming costume to work off my hearty lunch – the hotel had a gorgeous pool overlooking the valley and the nursery ski slopes. As for the cross-country, I’m hooked. I only wish we had more snow in the UK to practice. 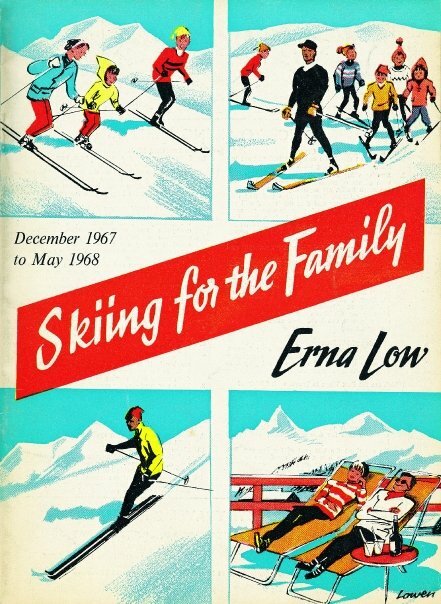 In the meantime, I’ll just have to take up roller-skiing instead. To hire cross country equipment at Sport Walter beside the Birkhahnbahn lift in Wirl costs €12 for one day, then €9 per day thereafter. 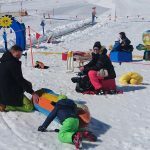 If you don’t fancy cross-country, Galtür also has a pretty downhill ski area with 40km of seldom-busy pistes, including a quaint Fairytale forest route for children; a gentle nursery slope for beginners with moving carpets, and a Bambiniland snow park for tinies. There are even four ‘family’ gondolas on the Breitspitzbahn which recount different fairytales about the region. Magical! 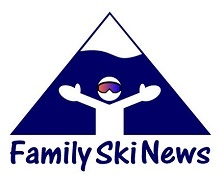 It’s also very cost effect for families, or those skiing on a low budget. 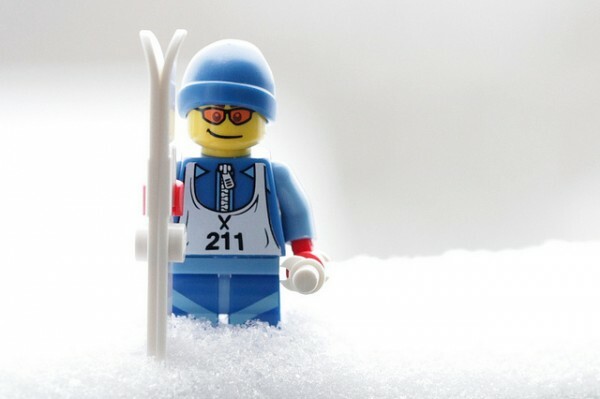 A Family Ski Pass is €315/€540 for 3/6 days for 2 adults and a minimum of 2 kids including ski rental (or for 1 adult and a minimum of 3 kids, €276.50/€472 for 3/6 days). 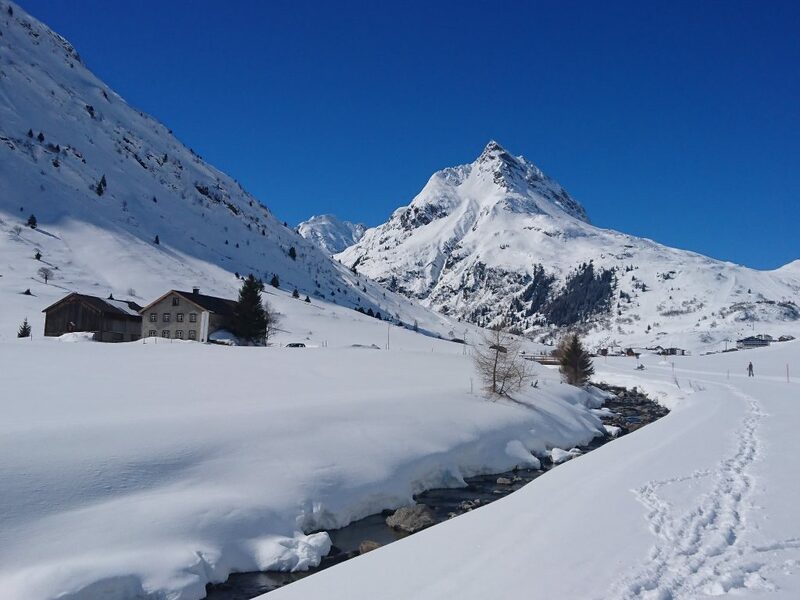 If, like us, you’re staying in Ischgl but fancy a daytrip here, the Silvretta Ski Pass covers Ischgl, See, Kappl and Galtür and costs from €256.50/€169 (adults/kids) for six days. Or you can choose a Regional Pass, enabling you to ski four days in Ischgl and two days elsewhere for €240/€160 (adults/kids). For further information on Hotel Almhof Galtür, click HERE. Package holidays to Hotel Almhof with Crystal Ski in March 2019 start from £1089 per person including flights, transfers and half-board accommodation.